A special category of buildings with a function consists of factories and offices, or more general ‘working-places’. They include all buildings, which are purpose-build to accommodate a certain productive human activity. Factories are communal working places, breathing the spirit of creation and action, but often without any deliberate reference to beauty. Offices are a modern equivalent, producing no direct visible result in terms of material visibility, but have taken over a great deal of modern activity (leaving the production side to so-called Third World Countries). The Industrial Revolution started in England at the end of the eighteenth century. It was a major psychological event in the cultural history of Europe. For the first time in its long existence, a mass movement of work, rather than war kept the minds of the European people occupied. The search for identity, which is innate in the visibility period of cultural entities as well as human beings, found an outlet in manual, machine-assisted labour. At least, that seemed to be a superficial observation of the sudden industrial activity. The reality had a different face. The economic progress and subsequent wealth gave rise to conflicts and wars, caused by the very development of a social identity and growth of nationalistic feelings. Whereas a ‘Third Quadrant’ war is a matter of individual initiatives (mercenaries brought together by rich and power-hungry individuals) then the ‘Fourth Quadrant’ war is a collective effort to reach or safeguard a common incentive (‘War on terror’). The two World Wars of the twentieth century were initiated in Europe. They are gripping examples of large populations going on the rampage to counteract their frustrations as political identities. Power was not their prime interest, but a feeling of dissatisfaction. Fig. 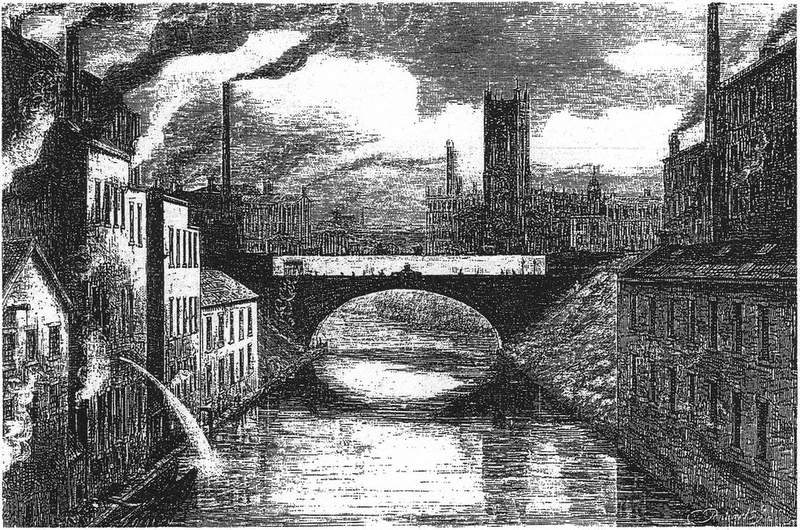 758 – The ‘Bridge of Tears’ over the River Irwell in Manchester (Eng-land) epitomized the misery and human suffering at the change from an individual experienced life to a collective being, which took place in the Industrial Revolution in England around 1800. Factories are modern places of contemplation, providing consolation for a personal and collective personality. This process, which started in England, was rather painful at its initial beginnings, when the (Third Quadrant) ‘power’ element was still strong (fig. 758). These sharp edges gradually disappeared when the (Fourth Quadrant) feelings could be expressed, for instance, in the Labour movement. They acted as a catalyst to widen the identity of a person to the identity of the group. The Larkin Soap Company was a successful soap manufacturer, which started business at the borders of Lake Erie and reached their zenith in the first decennia of the twentieth century. The company was a pioneering, national mail-order house with branch stores in Buffalo, New York City and Chicago. The architect Frank Lloyd Wright became involved (in 1904) in the design of the new office building in Buffalo, NY (fig. 759). The five story, dark red premises at 680 Seneca Street became the largest commercial building at the time and was designed as a model of efficiency. Fig. 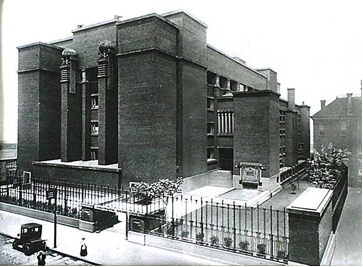 759 – The Larkin Building in Buffalo, NY was the first big commission for the American architect Frank Lloyd Wright. The building was demolished after a fire in 1949 to make way for a parking area. The Larkin Building in Buffalo (New York State) and the S.C. Johnson Company’s Administration Building at Racine (Wisconsin) were the only two large office building design by Frank Lloyd Wright. His career has been largely in the field of domestic architecture and was inspired by the spirit of Puritanism. The concept of a vocation and of work as a ‘calling’ was central to Wright’s life (WESLEY (1988). Work-spirit was, in his view, a potential salvation for collective life. He wrote in his autobiography (1943, p. 151): ‘Rebellious and protestant as I was myself when the Larkin Building came to me, I was conscious also that the only way to succeed, either as rebel or protestant, was to make architecture a genuine and constructive affirmation of the new Order of this Machine Age’. It is remarkable, but not surprising, that the structural concept of the four-fold helped to order his communication with the world. Ideality of form, great mass, permanence of material and memorability of plan were the hallmarks of Wright’s architecture. He designed a house for himself and his bride Catherine Tobin in 1889 near Chicago (Oakland Park, Illinois) with references to the Garden of Eden (Paradise). The House and Studio underwent alterations in 1895 when two major rooms were added to the House, a dining room and a playroom (Wright had six children). The latter had a cross-axial base beneath a barrel fault. The skylight featured a foursquare design. The concept of a ‘citta ideale’ was reflected in the geometrical ideality of the forms. The playroom became, according to Wesley, a ‘theatrum mundi’’. A mural was painted at the wall above the fireplace depicting the ‘Fisherman and the Genii’ from The Arabian Nights. This story tells about unity and redemption represented by ‘fourfoldness’. There were four casts of the Fisherman’s net, four fishes, four islands, four hills, a foursquare fountain and the four religions of the inhabitants. Richard Wesley noted in his paper of 1988 that the eastern myth abounded in tetradic symbolism and used metaphors similar to those found in the Biblical Book of Revelation. Fig. 760 – The design of the St. Mark’s Tower in New York was based on a tetradic plan. This project by Frank Lloyd Wright was abandoned in 1929, but resurfaced as the Price Tower in Bartlesville (Oklahoma) in 1954. The St. Mark’s Tower in New York City was another design by Frank Lloyd Wright, created in 1925. It had a distinct double tetradic plan (fig. 760). ‘The St. Mark’s Tower may seem to derive from the ‘organic’ demand for the integration of space and structure; and, as fulfilling this demand, the building becomes a single, complete, and self-explanatory utterance’ (ROWE, 1976; p. 94). Frank Lloyd Wright, just as his follower La Corbusier, considered the plan to be a generator of form, which would lead to a ‘disciplined orchestration of spaces’. The apartment tower for the vestry of St Mark’s-in-the-Bouweie in New York was never built, but Wright used the design again in 1954. The plan of the Price Tower in Bartlesville (Oklahoma) was copied from the St Mark’s tower, some twenty-five years after it was first designed. The tower is derived from a square, which is turned over forty-five degrees. Similar plans were also used in the temples of Dhobini in India (see p. 179; fig. 131). Architect Louis Sullivan (see also p. 851) had used the same tetradic symbolism much earlier (in 1914) as an eye-catcher at the brick front of the Merchants National Bank building in Grinnell (Iowa) (fig. 761). This place named itself the ‘Jewell of the Prairie’ and was nominated by the Budget Travel Magazine as ‘one of the coolest small towns in America’. Fig. 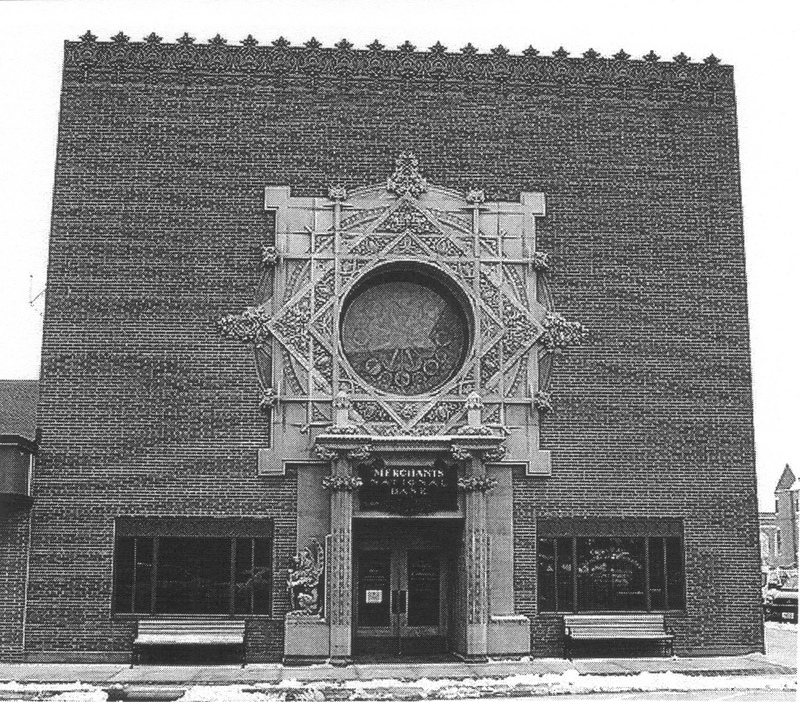 761 – The front of the Merchants National Bank building in Grinnell (Iowa) with a ‘rose window’ created by the architect Louis Sullivan in 1914. The ‘jewel-box’ bank is part of a group of eight such banks in the Midwest of the United States. The so-called Chicago School, with its emphasis on skeletons of steel and/or concrete frames, brought a whole new type of building into being in the eighties and early nineties of the nineteenth century. Colin ROWE (1976) could make the statement that ‘the exposure of the frame became the hallmark of modern architecture in a similar way as the column did in the classical antiquity and Renaissance’. The steel frame was the solution of a specific problem. High-raised steel-framed building became logical instruments of business propositions, born in rationalism. Fig. 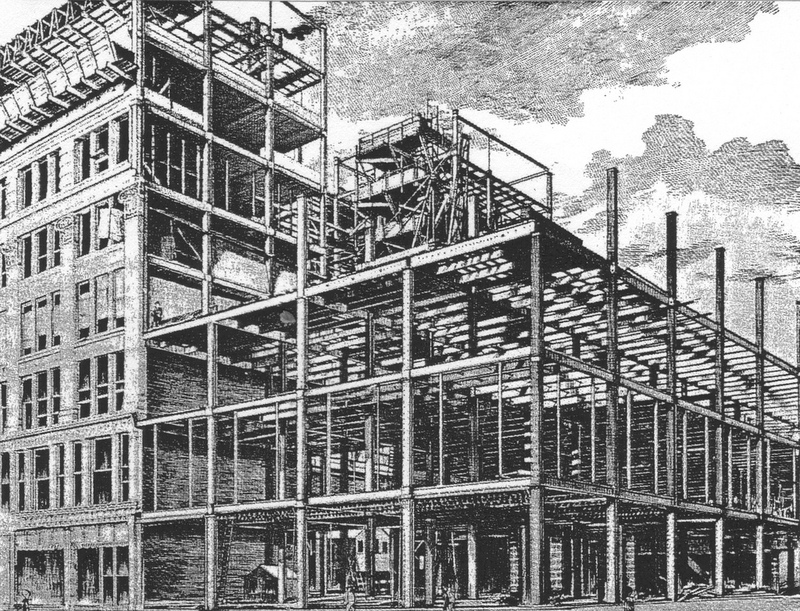 762 – The Fair Building was one of Chicago’s great department stores, seen here during its construction in 1891 at the corner of State and Adams Streets. The skeleton was the determining factor in the design and the use of glass enabled the maximum quantity of light to reach the display areas. The building was closed and demolished in 1984. The Fair Building in Chicago (1891–92), at the corner of State and Adams Streets, was the flagship of the chain of department stores founded by Ernst J. Lehmann. It was designed by William Le Baron Jenney (1832 – 1907) (fig. 762). When the store was completed in 1897, it was said to be two and a half times as large as the Bon Marché department store in Paris. The success of his businesses had detrimental consequences for Lehmann’s mental health. He spent nine years in the Bloomingdale Asylum for the Insane in White Plains, New York and died in January 1900. The Chicago Tribune attributed his death to the pressures of running a business and gaining sudden fortune. ‘Instead of running one large store, he was in reality running scores of them. To keep the details of this largely ramified business in his head was no ordinary task. It occupied all his time and absorbed all his energies. It gave him no time for rest…. The result was inevitable. Overwork and the weight of unaccustomed wealth broke him down physically and mentally….’ (Scott A. Newman: The Fair in: Jazz Age Chicago, 2007). Another classic Chicago building is the McGlurg Building by the architects William Holabird (1854 – 1923, who worked in Jenney’s office in 1875) and Martin Roche (1853 – 1927). It is one of the smaller skyscrapers of Chicago built in 1899 and making a simple and uncomplicated statement. It had approximately nine thousand square feet of glass embedded in terra-cotta coated piers and spandrels. The side walls were totally windowless. It got its name from the first tenants, A.C. McClurg & Company, booksellers and stationer. A good overview of the various American skyscrapers and their history is given in a book by Joseph J. KOROM (2008). The American ‘celebration of height’ had a slow start in Europe and had to wait until the beginning of the twentieth century. ‘Het Witte Huis’ was built in Rotterdam (The Netherlands) in 1897-1898 and qualified, for a while, as the highest office building in Europe. It’s height was forty-three meters… The ground plan was 20 x 20 meters (originally 15 x 20 meters but was changed after difficulties during the building process). In other words: no square intentions were initially present. The building has no steel skeleton and is for that reason outside the league of proper skyscrapers. The hallmark of Liverpool, the Royal Liver Building at the Pier Head, was probably the first sky-scraper in Europe in a modern sense. Its thirteen floors and revolutionary steel and concrete structure were designed by Walter Aubrey Thomas (1859 – 1934) and completed in 1911. The total height was ninety meters. On top of the building are two towers with the mythical Liver Birds, symbol of Liverpool (fig. 763). The copper birds are a cross between an eagle and a cormorant and were produced by the German sculptor Carl Bernard Bartels (1866 – 1955). He was arrested during the First World War and imprisoned on the Isle of Man. After the war, he was sent back to Germany, despite his naturalization for twenty years, and all references to his achievements were removed. Later he returned to England and produced carvings for Durham cathedral and stately homes. He made artificial limbs during the Second World War. Fig. 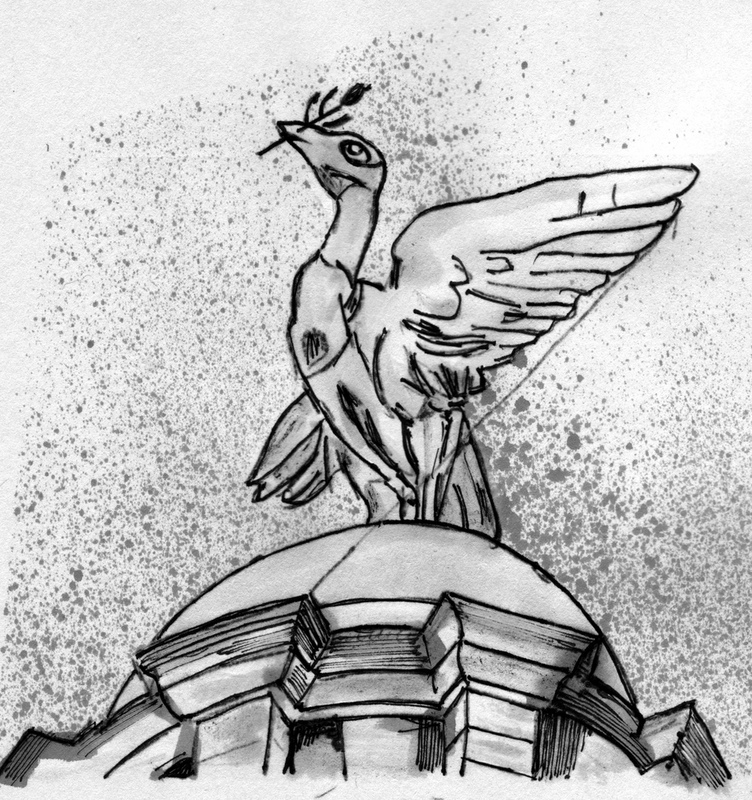 763 – A Liver bird at the top of the Royal Liver Building at the Pier Head in Liverpool, made by Carl Bernard Bartels. The building signaled the start of skyscraper building in England in 1911 (drawing by Marten Kuilman). The KBC Building in Antwerp (Belgium), also known as the Boerentoren, was constructed between 1929 and 1932 as part of the Antwerp World Exhibition 1930 and could be seen as the ‘first skyscraper of continental Europe’. However, its priority is hard to establish because this type of buildings sprang up all over the Continent at this point of time. The Mosselprom Building in Moscow (1923-1924) – by the architects Kogan, Loleit and Tsvetaev – had nine stories and could qualify as well. The Kirovsky Town Hall of St. Petersburg (1932-34), by Noi Trotsky (1895 – 1940), was already higher and more ambitious. The Russian Constructivists (like El Lissitzky) embraced geometry and technologically advanced aesthetics of the skyscrapers wholeheartedly. An equivalent functionality was created in Germany with the establishment of the Deutsche Werkbund in 1907. Peter Behrens (1868 – 1940) worked as an artistic consultant for the AEG Company and designed their products and the AEG Turbine factory (1908 – 1910) in Berlin. He can be seen as the inventor of the corporate design. The Bauhaus movement in Germany, founded by Walter Gropius (1883 – 1969) in Weimar in 1919, continued along this road. The movement shifted in 1922 to a ‘new unity of art technology’. The Bauhaus building in Dessau (1919 – 1925), designed by Gropius, was used as an art and architecture school and is their pièce de résistance. Vkhutemas, the Russian state art and technical school founded in 1920 in Moscow, could be compared to Bauhaus. A well-known student of Vkhutemas was the architect Ivan Leonidov (1902 – 1959), one of the de-urbanists (see p. 784 and p. 834). The Mostorg store of the Vesnin brothers (1927) is just one example of the outcome of the new direction of Modernism. The Van Nelle factory in Rotterdam (Nederland), designed by Johannes Brinkman, Leendert van der Vlugt and Mart Stam, is another specimen of Western Constructivism (fig. 764). The building was completed in 1931. Fig. 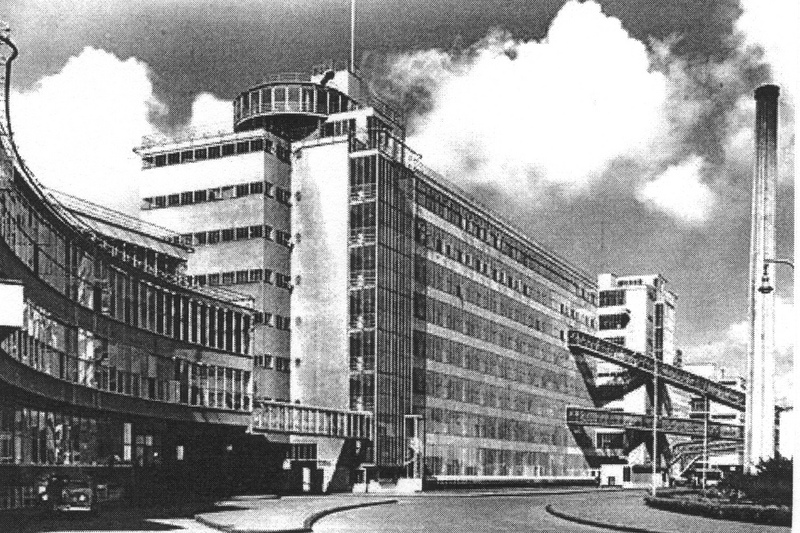 764 – The Van Nelle Company factory in Rotterdam, dating from 1929, is an example of Western Constructivism, which was the Russian/European answer to the American development of skyscrapers. The number of high rise buildings took off after the Second World War and became a familiar feature of many large cities. The complex of the ‘Seven Sisters’ in Moscow (‘Stalin’s tall buildings’) was built shortly after the war (1947 – 1953). The buildings are occupied by the Hotel Ukraina, Kotel-nicheskaya Embankment Apartments, the Kudrinskaya Square Building, the Leningradskaya Hotel, the Ministry of Foreign Affairs, Moscow State University, and the Red Gates Administrative Building. The Moscow State University main building at Sparrow Hills was completed in 1953 and reached a height of two hundred and forty meters. The architect was Lev Rudnev (1885 – 1956). The Palace of Culture and Science in Warsaw (Poland) was another post-war high rise building (1952-1955) with a height of two hundred and thirty seven meters. However, the large cities in the United States continued their leading role in the building of skyscrapers. The German-American architect Mies van der Rohe (1886 – 1969) became one of the founding fathers of modern architecture (GOSSEL, 2006). He had worked for Peter Behrens and met Walter Gropius and Le Corbusier (1908 – 1911). He contributed to some houses for the Weissenhof Siedlung in Stuttgart and designed the German Pavilion for the World Exposition in Barcelona in 1929 (rebuilt in 1999). 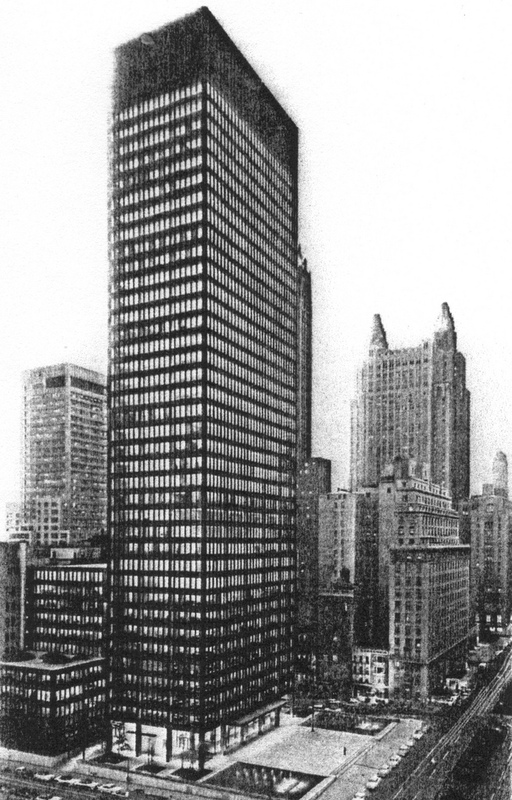 His Seagram Building in New York is a typical example of the International Style (fig. 765). The United Nations Headquarters, also in New York and completed in 1950 – designed by a multinational team of architects, including Le Corbusier and Oscar Niemeyer – is another. Fig. 765 – The Seagram Building in New York, by the architects Mies van der Rohe and Philip Johnson, confirmed the leading role of the United States in building high-rise buildings. The cubic constructions (‘boxes’) of steel and glass became known as the International Style for the very reason that many countries all over the world tried this concept in their large cities. The ideas behind this type of building in the International Style initially aimed at functionality. This aspect was emphasized by the Dutch architect J.J.P. Oud (1890 – 1963), but the intentions soon drifted into an aesthetic style concerned with simplification, clarity and a ban on decorations. The term ‘International Style’ was first used in an exhibition catalog (written by Philip Johnson and Henry Russell Hitchcock) for the Museum of Modern Art in 1932. 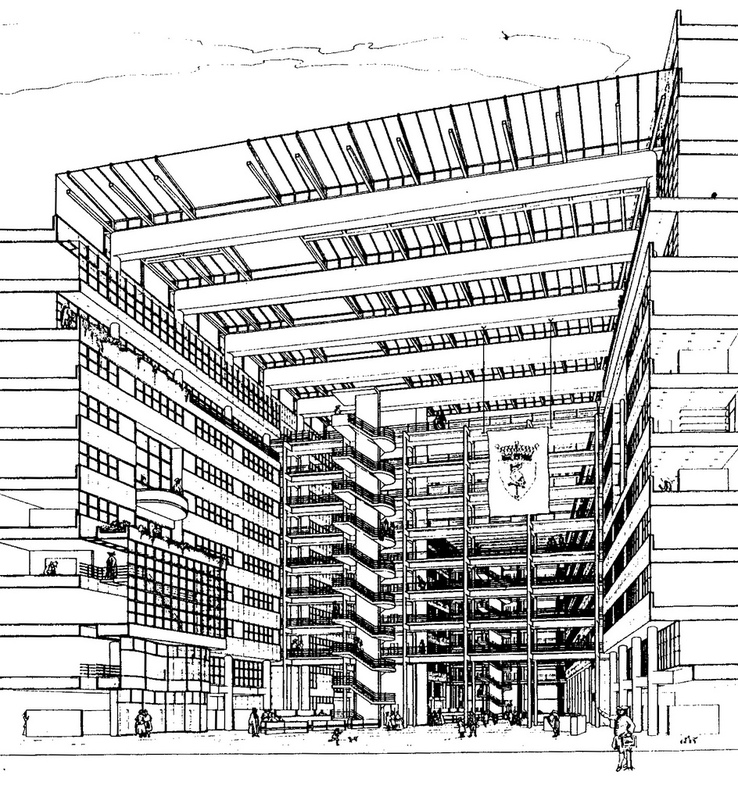 The PSFS Building in Philadelphia, completed in that very year, was a firm founding statement. The building was designed by an inter-national team of architects under the direction of George Howe and William Lescaze. Many cities in Canada, like Vancouver, Calgary, Edmonton and Toronto, had their skylines formed by buildings of the International Style. The city of Tel Aviv (Israel) – as described in Michael Levin’s book ‘White City, International Style Architecture in Israel’ (1984) – has an exceptional high number of buildings in this style, due to the building boom in the period 1931 – 1937. 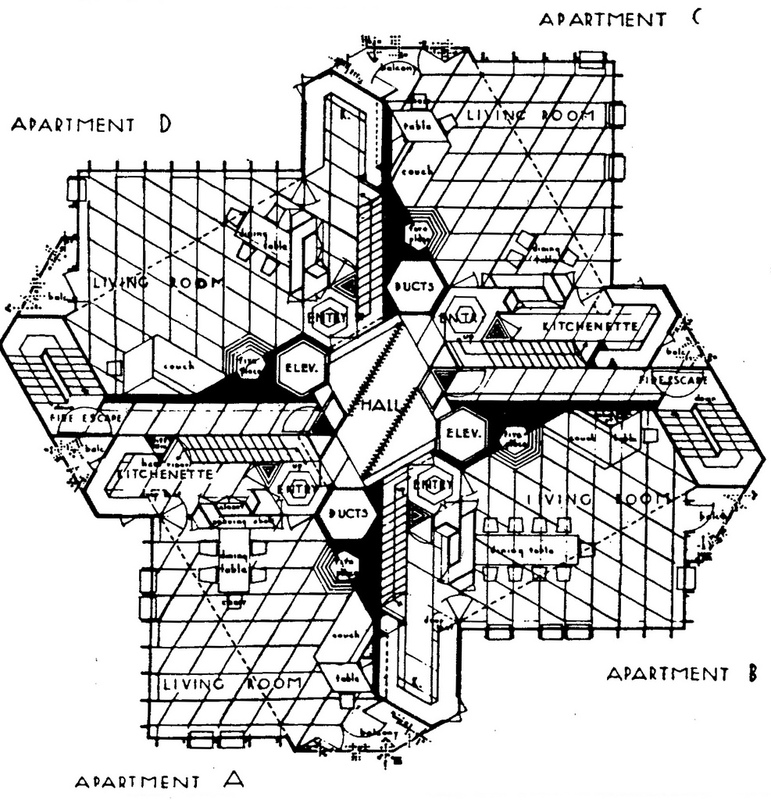 Most of the residential structures can be found in an area designed by Patrick Geddes in 1925. Geddes had drawn a master plan of Jerusalem some six years earlier (1919). His belief was that spatial form and social processes were mutual related and any change of the former could influence the latter. Geddes’ ideas of a garden city did not materialize, due to what the geographer Gideon Bigger called ‘the gangrene of the city development in the 1930’s’ (WEILL-ROCHENT, 2003). Fig. 766 – Some square and circular design elements in buildings of the International Style. To the left: Ground plan of the Pennzoil Place in Houston (Texas). 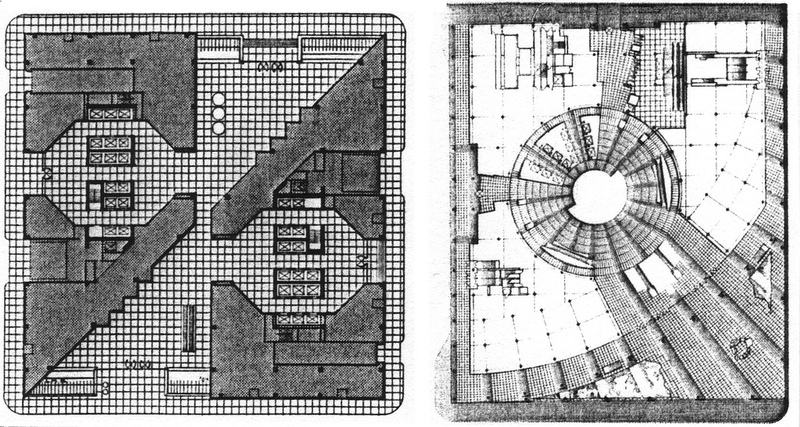 To the right: Plan of the office spaces of the Thompson Center in Chicago (Illinois) with a circular atrium. The spell of glass boxes only diminished in the 1970’s and a Postmodernist Style emerged. The unornamented buildings of the International Style, devoid of any local or historical references, were often characterized as ugly and sterile. However, these ‘boxes’ of steel and glass did have some references to the fourfold, other than their cubic character. The plans sometimes revealed elaborate variations on the theme of squares and circles (fig. 766). The gigantic black towers of the Pennzoil Place in Houston (Texas), by Phillip Johnson and John Burgee (1972-76) seem to slide past each other in a plan (fig. 766 left), while the Thompson Center in Chicago (by Helmut Jahn) has a circular central rotunda of fifty meters, which rises the full seventeen stories of the building (fig. 766 right). The inner structure of the building has similarities with the City Hall of The Hague (Nederland) by Richard Meier (fig. 767). Fig. 767 – The City Hall and library of The Hague (The Netherlands) by the architect Richard Meier exhibits an explosion of exposed metal framing, pointing to multiplicity. The design dated from 1986, while building took place from 1990 – 1995. Lever House by Skidmore, Owings & Merrill, built in New York in 1951-52 opened the long line of similar buildings with seemingly weightless glass walls. Some twenty years later the Renaissance Center in Detroit (by John Portman, 1973-75) and 1 South Wacker in Chicago (by Helmut Jahn, 1979-82) marked the apotheosis of this distinct type of office towers sheathed in reflective glass. Architectural Modernism, which ‘ruled’ from 1940 to 1973, moved gradually into the Postmodernist style. The reductive and monotonous character of the former was changed in an emphatic expressionism with a strong decorative notion of the latter. New materials and techniques added to the possibilities of building. These rapid artistic movements at the end of the first part of the Fourth Quadrant of the European cultural history (IV, 1; 1800 – 1950; see fig. 267) highlight the growing influence of multiple thinking in this part of the communication. The Romans had seen similar developments in their cultural experience (125 – 250 AD, see fig. 88) and the Greek in their ‘Classical Period’ before them (375 – 300 BC., see fig. 74). The relations between the architectural achievements of the early twentieth century, both encountered in America and Europe and the intentions of quadralectic architecture are difficult to establish. The ‘square’ approach – as established in the metal framework of the buildings – could point to the four-fold, but then in a rather direct way, which is also associated with the two-fold way of thinking. The functionalism was initially counteracted by a strong element of esthetic design, which created the unique mix in the architecture of factories, offices and houses from the Interbellum years. This artistic element was greatly reduced in the mature years of the International Style. The Art Nouveau (Jugendstil) aspect was particular accentuated in the designs of the Belgian architect Victor Horta (1861 – 1947). His Maison du Peuple (Volkshuis) was opened in 1899, but despite public protests demolished in 1965/66. It was replaced by the twenty-six stories high Zaveltoren. The department store ‘Innovation’ burned down in 1968, leaving no more visible evidence of Horta’s creative spirit. There are, however, still some ‘Horta’’ buildings left to appreciate in Brussels (Tassel House, Hotel van Eetvelde, Hotel Solvay and the Horta Museum). The curved line was one of the hallmarks of his style, which had reminiscences to the Baroque style of the late 16th century to the early 18th century. A sense of opposition to the square and straight could be the driving force behind the architectonic features, which were applied. The joyful and fanciful expressions of both styles seem to point to a Fourth Quadrant environment. They might be – at close scrutiny – also a direct, reactionary result of oppositional thinking in the Third Quadrant. The relation between the decorative and non-decorative elements in art was placed by Aloïs RIEGL (2004) in a wider cultural-historical context. He envisaged in all artistic activity a fluctuation of motifs between two poles: the harmonic and the organic. Physical beauty comes about in harmony, like in symmetry (or crystallization) and proportion, while the spiritual improvement of nature will be inclined toward the organic (motion). The latter is related to the act of organization. Riegl (1858 – 1905) believed that in the ‘battle between these two impulses’ (p. 78) the northern part of Europe (including the North-Italian part of Lombardy) was geared towards the progressive, naturalistic (‘organic’) and spiritual animated, while the southern (‘classical’) half was backward-looking, aiming at the physically perfect (‘harmonic’), but spiritually vacant. This battle lasted, according to Riegl, for the greater part of the Middle Ages and only ended in 1520. Aloïs Riegl envisaged three main periods in art history, characterized by the duality of polytheism versus monotheism. The first period (art perfects nature) was preceded by an ‘infinite polytheism’, because everything in nature (matter) was a ‘god’, stronger than man. This situation changed when man realized certain superiority over other creatures of nature, but at the same time acknowledging his inferiority to the natural forces. The absolute unity of matter and spirit remained in this process in force. A form of ‘anthropomorphic polytheism’ was born. Gods were superior, but they looked like man. The first period grew in the ancient Egyptian art, flourished in the Greek art and declined prior to Alexander the Great. Then six centuries followed in which art contested with transitory matter, ending with Constantine the Great (early fourth century AD). The second period (art spiritualizes nature) was governed by monotheism as favored by the Semitic race. Theosophical speculation could lead to the conclusion that a single force was the original agent of all natural phenomena. ‘The Jews enjoyed the contemplative leisure time necessary for intensive and lucid reflection on the monotheistic notion of God’ (Riegl, 2004; p. 68). A two-fold kind of Justice (an eye for an eye) became their ethical guideline, which was changed in the early Christian (four-fold) world-view to the prerogative of Love. Aloïs Riegl further noticed (p. 312) that the Jews did not contribute to great works of art: ‘The extreme importance of the Jews within the larger history of art is rooted not in the works they created, but in the fact that they created none at all’. One of the reasons was the split in matter and spirit. The division of Jews from the (pagan) Christians in the first century AD found its very reason in this subject and the different interpretations in the West and East. The Oriental world view (known in the fifth century AD as Monophysitism) put the emphasis on the unity of deification (of Christ), while the Western view defended a double nature of Christ (leaving room for higher division thinking). The early Roman Catholic teachings created – in their environment of higher division thinking – a tolerance for the material world, while their Byzantine counterparts – in a lower division thinking setting – were unable to create that cognitive space and were more hostile to matter. The Eastern Christian believers regarded Western Christianity as a kind of polytheism (p. 329). The development of Islam enhanced the differences. The Trinity was discarded and the material world was believed to be dead and soulless. Their visible material symbol of the divine became a stone, the Kaaba. A prohibition of images led to a search for abstract ornaments, derived from an inanimate nature. The period of Christian Monotheism lasted from 313 to 1520. The third period (natural-scientific) is characterized by a harmonic world which resides in the law of causality. The emphasis on individualism – as claimed in the doctrine of free will – was initially opposed to a law of causality, but gained terrain at the end of the Middle Ages in Scholasticism. The break came, according to Riegl, in 1520 when Luther objected to the individualism of the Church and abandoned free will, to be replaced by a fixed predestination. Only God is in control of the law, and man possesses no individual volition. This 180-degree turn took place at the Pivotal Point of the European cultural history. Harmony was created in paintings with objects as images in nature. The causal relationship became the purpose of art. Nature and human beings reached an equal status. Europe’s first half of its visible cultural presence (750 – 2250) had ended by that time. The subject of this chapter on factories and office buildings and their association with decoration devices has probably drifted too far away by now. However, Riegl’s historical panorama is, nevertheless, relevant for every type of building, because it aimed at the very heart of architecture as a human endeavor.